Multichoice Africa: New PID for Disney Channel U.K.: PID:231/232 English SID:213 (12054.00MHz, pol.H SR:27500 FEC:3/4 - Irdeto 2). Sky Digital: New FEC for Disney Channel U.K. on 11914.00MHz, pol.H: FEC:5/6 ( SR:27500 SID:9102 PID:2311/2313 nar,2312 English - VideoGuard). Sky Digital: New frequency for Disney Channel U.K.: 11914.00MHz, pol.H (DVB-S SR:27500 FEC:2/3 SID:9102 PID:2311/2313 nar,2312 English- VideoGuard). Disney Channel U.K. switched to Astra 1N satellite at 10862.00MHz, pol.H (DVB-S , 10862.00MHz, pol.H SR:22000 FEC:5/6 PID:2316/2317 English,2318 English,2320 English). Sky Digital: New PID for Disney Channel U.K.: PID:2316/2317 English,2318 English,2320 English SID:9001 (10862.00MHz, pol.H SR:22000 FEC:5/6 - VideoGuard). Sky Italia: New SR for Disney Channel U.K. on 12635.00MHz, pol.V: SR:29900 ( FEC:3/4 SID:11454 PID:165/420 English - VideoGuard). Sky Digital: New PID for Disney Channel U.K.: PID:2306/2307 English,2308 English,2310 English SID:9001 (10862.00MHz, pol.H SR:22000 FEC:5/6 - VideoGuard). Multichoice Africa: Disney Channel U.K. is now encrypted in Irdeto 2 (12054.00MHz, pol.H SR:27500 FEC:3/4 SID:213 PID:1874/1875 English). Multichoice Africa: Disney Channel U.K. (United Kingdom) is now transmitted Free To Air (12054.00MHz, pol.H SR:27500 FEC:3/4 SID:213 PID:1874/1875 English). Multichoice Africa: New PID for Disney Channel U.K.: PID:1874/1875 English SID:213 (12054.00MHz, pol.H SR:27500 FEC:3/4 - Irdeto 2). Disney Channel U.K. switched to Hot Bird 13C satellite at 12635.00MHz, pol.V (DVB-S , 12635.00MHz, pol.V SR:27500 FEC:3/4 PID:165/420 English). Sky Italia: Disney Channel U.K. (United Kingdom) broadcasts in DVB-S VideoGuard on 12635.00MHz, pol.V SR:27500 FEC:3/4 SID:11454 PID:165/420 English. 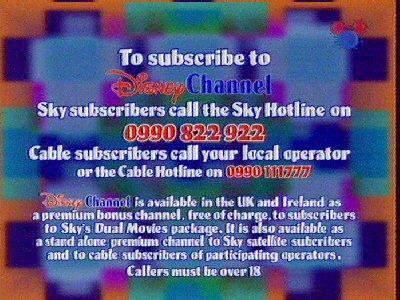 Sky Digital: New PID for Disney Channel U.K.: PID:2307/2308 English,2309 English,2311 English SID:9001 (10862.00MHz, pol.H SR:22000 FEC:5/6 - VideoGuard). Sky Digital: New PID for Disney Channel U.K.: PID:2307/2308 English,2309 nar,2312 nar SID:9001 (10862.00MHz, pol.H SR:22000 FEC:5/6 - VideoGuard). Sky Digital: New PID for Disney Channel U.K.: PID:2306/2307 English,2310 English SID:9001 (10862.00MHz, pol.H SR:22000 FEC:5/6 - VideoGuard). Sky Digital: New PID for Disney Channel U.K.: PID:2308/2309 English SID:9001 (10862.00MHz, pol.H SR:22000 FEC:5/6 - VideoGuard). Sky Digital: New PID for Disney Channel U.K.: PID:2307/2308 English SID:9001 (10862.00MHz, pol.H SR:22000 FEC:5/6 - VideoGuard). Sky Digital: New frequency for Disney Channel U.K.: 11604.00MHz, pol.V (DVB-S SR:22000 FEC:5/6 SID:9001 PID:2306/2307 English- VideoGuard).